Not much more needs to be said about the book, other than that it should be read, for Riminton’s statements both sum up my sentiments and do so more eloquently than I ever could. And while I inhaled the eminently readable The Tattooist in one three-hour sitting when it first came out, it’s taken me some time to get round to writing this blog post about it—the subject matter was so stellar and so moving I needed some time to gather my thoughts. For anyone who is still unfamiliar with the book, which has been a bestseller since its launch and which has undergone multiple reprints, it is a fictionalised account of a non-fiction story: that of concentration camp prisoners Lale (pronounced ‘Lah-lay’) and Gita (Ghee-ta) Sokolov. 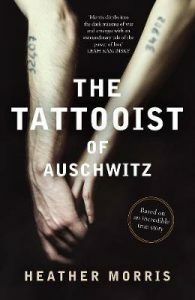 The prologue begins with Slovakian Jewish prisoner Lale tattooing the number 34902 on Gita, the woman who was to become the love of his life, in Auschwitz-Birkenau in 1942. Conflicted about his role in inflicting pain on his fellow prisoners, but also aware that he must do whatever he can to survive, Lale finds that his tattooist role provides him safe passage around the concentration camps and extra rations, both of which he leverages to help himself and others. Deftly woven throughout, and offsetting the horror, is Lale and Gita’s love story. ‘To save one is to save the world’ is a phrase uttered in, and that aptly captures the tales contained within, The Tattooist. The book was originally conceived as a screenplay, with author Heather Morris capturing Lale’s story through interviews and penning drafts that eventually became a novel. Morris spoke wonderfully eloquently about the book and the interviewing and writing process on Conversations with Richard Fidler. I highly recommend listening to that interview in tandem with reading the book. The Tattooist is invaluable because we have little true insight into what it was like to actually live—well, exist—inside those concentration camps. And there are moments that continue to haunt me. For instance, Lale regularly encountered the infamous doctor Josef Mengele, who prowled the tattooing line, looking for victims, and who has since been revealed to have committed all manner of heinous medical research on prisoners. ‘Are you sure you’re not a cat?’ the same SS officer asks Lale at one time because he survived so many moments that would otherwise mean certain death. It’s a thought that had crossed my mind too, because although the tale is incredibly compelling, just occasionally I couldn’t quite fathom how Lale had survived when so many others hadn’t. Undoubtedly, his ability to speak multiple languages and his charisma were contributing factors. Still, some questions remain for me: What happened to the tattooist who preceded Lale and who gave him his chance? And Aron, who saved him from Typhus? And was Lale not terrified having the SS know Gita was his girlfriend? Surely they’d have used that to torture him? Perhaps one day, with others having read the book and recognised overlaps with their own or their relatives’ stories, those questions will be answered. Side note: While I would unhesitatingly recommend The Tattooist to anyone and everyone and stump up a case for why it should be on school and university reading lists, my one wish is that the book was non-fiction rather than fiction. Hazarding a guess, I’d say the author and publisher elected to couch it as fiction to cover themselves for any facts they couldn’t definitively verify—of which there were likely many given that so few people who could attest to their veracity are still alive. But still: The Tattooist is essentially a retelling of one man’s recollection of actual events, however surreal they may seem, and it jars slightly for me to have the tale fictionalised. Regardless, my hope is that The Tattooist not only succeeds as a novel, but also as the film Morris and Lale originally envisaged it to be: with Brad Pitt playing Lale and Natalie Portman playing Gita.